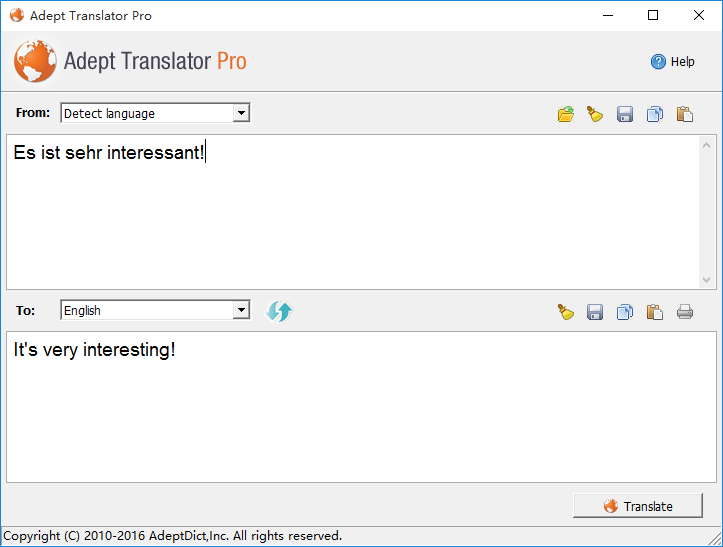 Quick and Exact to translate Web contents, letters, chat, emails between in 72 different languages. 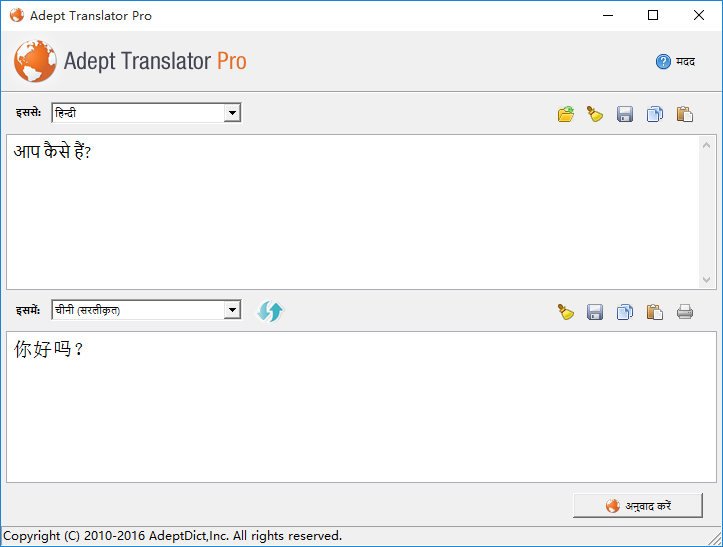 Adept Translator Pro is an online translating software that supports 72 different languages and uses internet resources to translate any text you want. 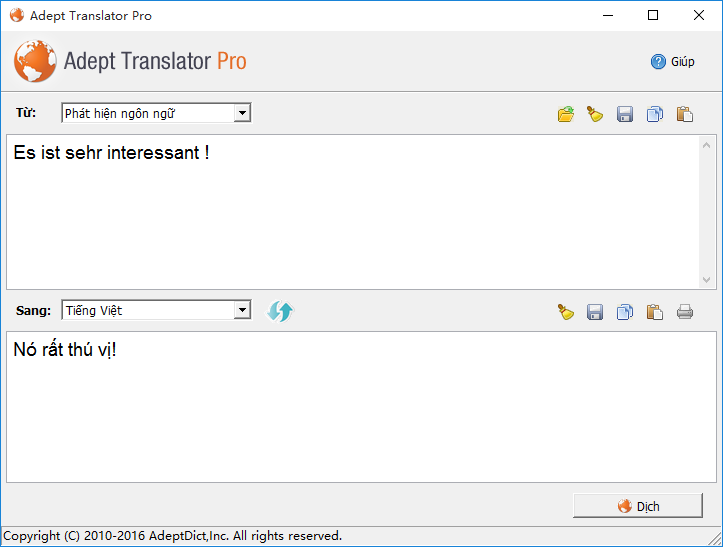 Currently the program is capable of translating to/from the following languages: English, Afrikaans, Albanian, Arabic, Armenian, Azerbaijani, Basque, Belarusian, Bengali, Bosnian, Bulgarian, Catalan, Cebuano, Chinese (Simplified), Chinese (Traditional), Croatian, Czech, Danish, Dutch, Esperanto, Estonian, Filipino, Finnish, French, Galician, Georgian, German, Greek, Gujarati, Haitian Creole, Hebrew, Hindi, Hmong, Hungarian, Icelandic, Indonesian, Irish, Italian, Japanese, Javanese, Kannada, Khmer, Korean, Lao, Latin, Latvian, Lithuanian, Macedonian, Malay, Maltese, Marathi, Norwegian, Persian, Polish, Portuguese, Romanian, Russian, Serbian, Slovak, Slovenian, Spanish, Swahili, Swedish, Tamil, Telugu, Thai, Turkish, Ukrainian, Urdu, Vietnamese, Welsh and Yiddish. 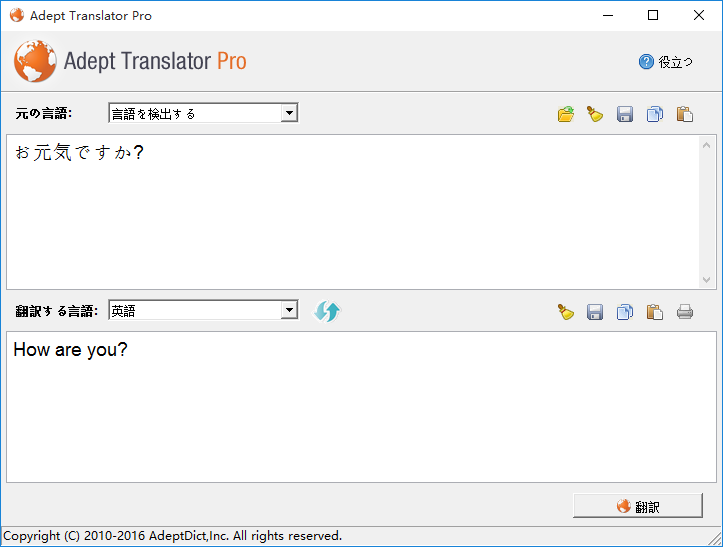 Adept Translator Pro supports Microsoft Windows 10/8/7/Vista/XP (32-bit & 64-bit).